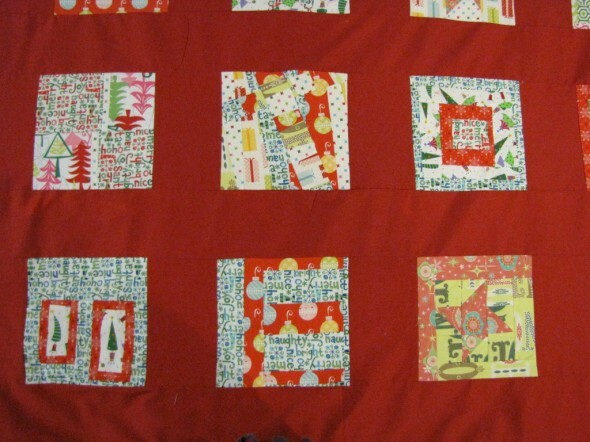 Other posts on this project: Gearing Up for July Bee Improvisational, Bee Improvisational: Christmas in July!, Christmas in July Packages Are Mailed, Christmas Tree Skirt Pt. 1. Here’s a closeup of the tree skirt top. I’ve actually now FINISHED the tree skirt, can’t believe how fast it came together. But I’ll post those photos later. Tomorrow’s our Christmas party, time for a good night’s sleep before the crazy party prep begins.